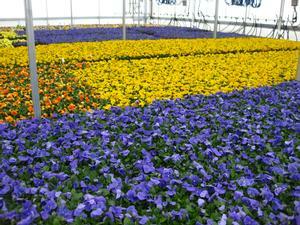 At Hood's Gardens, we grow a large percentage of our materials on specific orders from our customers. These items can be 1801 flats for landscape contractors to large 24 inch Patio Planters for a local garden center. Proper timing is imparative in this regard, as we can then work together with you to create the look and feel that you want. From a jobsite that is calling for a specific annual to a custom container for your garden center - we will fill the needs of our customers. Planning is always happening, for the next season or the next year, we always have to be looking ahead at Hood's Gardens - which allows us to best serve you.